Let me start by saying I haven’t tried to clean an atomizer since the eGo MEGA days when the atomizer was pretty much part of the tank – and I destroyed every atomizer I tried it on, or it simply didn’t work. I tried using a boiling method, alcohol, and something else. So needless to say, I just replace them when they start to act up. Protank Update – Instead of getting a 10-20 day usage out of my Protank atomizers, like I am accustomed to with the T3, I’m getting more like 2-4 days right now. At that point I start to experience poor performance, gurgling sounds, and juice in the mouth, while at other times I get dry burnt hits with no flavor. I can’t say this is the Protank atomizer itself (like a design flaw or something) but rather it could be my juice and voltage settings. Not long after getting the Protank I switched juices. Previously I was using a 50/50 pg/vg mix of a fairly medium consistency, not too thick not too thin. With all of these issues I have been using a 70/30 mix of a thin and acidic juice (lemonade from provape.com – which btw I love, tastes like a sweet tart!) I’m too stubborn to try a different juice right now to see if that really is the issue – I want to see this bottle to the end! Cleaning Atomizers – If I’m only getting 2-4 days out of my atty’s right now, I decided to try cleaning again after all these years. Turns out, maintenance on your atomizer actually CAN restore life! Here is the step by step process I used to clean and revive my Protank atty’s (and should work on just about any similar atomizer.) I performed this process on three of my failing atomizers, and so far two of them test great, and only one seems to be completely dead. Don’t let all the steps put you off, it really is easy! If still on your battery, remove the bottom plate/atomizer, then unscrew the atomizer from the bottom plate. Otherwise just grab any number of failing atomizers you have and work on all of them at the same time. With the atomizer now by itself, slip off the rubber grommet around the tall stalk of the top end, rinse with water and keep in a safe place. Next grab the bottom end of the atomizer and the long top end of the stalk with your other hand, pull these apart (you can put pressure on the stalk back and forth to help break it loose.) If you can’t get a good grip on the base of the atomizer, screw it back into the bottom plate of the Protank and grip that to pull. 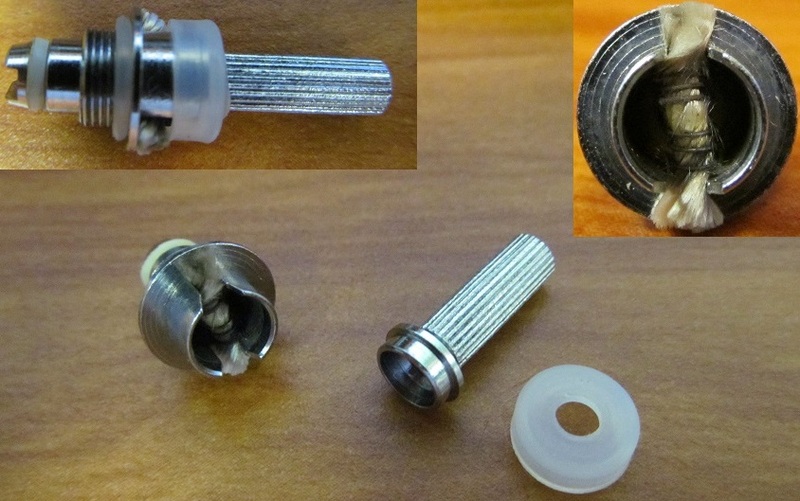 Once you get the stalk off, this will expose the inside of the atomizer with the coiled wick. Rinse the stalk and you should be able to see through it – if so set aside with the grommet – if not keep with the atomizer base and perform the same procedure on the stalk. Next you are going to run the atomizer base containing the coiled wick through your coffee maker. put it in the filter basket or paper filter and run a pot of clear water through it. next put the atomizer in the carafe of hot water and let it soak overnight. In the morning, drain. Now we are going to dry burn it. Take the bottom plate of the Protank and screw it onto a variable voltage battery. Screw in the base of the cleaned atomizer carefully and not too tightly but enough to make contact with the battery. Now with the atomizer guts exposed and hooked up to the battery, set the voltage at 3.2 volts and burn it for as many seconds until your battery cuts off the hit – or around 6-8 seconds or so, but you want to see the coils burn red. You should now see that a lot of the gunk is gone, and you are burning off any left. Crank the voltage up to 3.4 and repeat. Repeat at 3.6, and at 3.8 and at 4.0. Also while burning, you can see the coils better while they are red. Some people say to take a pin and poke the coils around to ensure that the coils are evenly spaced apart if they aren’t already. I didn’t touch mine honestly, they looked evenly spaced except a big gap in the center but I just left it alone. Next remove the atomizer base from the battery and Protank base plate. back in the coffee pot for another fresh pot of water to run through it and remove burned residue. remove the atomizer and allow it to dry. You can quicken the process by blowing into it and smacking it down on the counter, just get all the loose drops of water up. Allow to completely dry — or you can re-assemble the atomizer now and burn it at 3.2v a few times to remove excess moisture. Next, put the atomizer back together by inserting the stalk into the base and pushing until the rims of the stalk and base are flush all the way around – next insert the grommet back over the talk and push all the way down until it’s on the atomizer good. If you didn’t let it dry all the way, screw it into the base plate of the Protank and attach to a battery – burn at 3.2v once should do it. Last, it’s time to use it. put everything back together and fill up your Protank with new juice. Do one more burn at 3.2v without hitting it and let it rest for a good 5 minutes so the juice wicks up into the newly cleaned wick. It may take still one or two hits especially if you didn’t let it dry all the way before it runs like it should, but then it should work like almost-new. So if you’ve got a failing atomizer, no matter how long it’s lasted you until now, you can always try cleaning it and see if that revives some signs of life in it. EDIT: As to my juice in question, I’ve lowered the voltage on my Provari and I’m also noticing the Protank is performing better now, provided I don’t chain vape too much, letting it rest a bit so the juice wicks up into the atomizer. EDIT2: It was the juice – problems persisted until I switched juices. Also tried the juice in question in a T3 and had similar issues. What juice ratio do you use now? I’m having a love hate relationship with my protank. I have all the flooding juice in the mouth sometimes. If I add a wicks Protank performs like no other. The vape is amazing. You are going to need several heads with this kanger and some extra “flavor” wicks. I recently switched to a 50/50 PG/VG mix and the juice is also more thick, and it made all the difference in the world. I’m now over 2 weeks on the same atomizer without any issues!!! I do suspect however that adding a flavor wick or some cotton to the atomizer would help out. Nice guide. Thanks for sharing. I’m a vaping noob, and I am on my 3rd day with a Protank which came with two atomizers. I started getting lousy hits and then a bad plastic taste, and have been trying to figure out what’s gone wrong. Washed my tank out and put fresh juice and it still tasted strange. Tried the second atomizer, and still had that taste. Tried dry burning it and now it is tasting great and the cloud of vapor is massive. It’s working like new. So apparently the issue is the first atomizer is dirty and gunked, and I am hitting burnt up coils. Going to follow you instructions and see if I can restore the original atomizer. I have an Ego Twist set to 3.8v, on a 50/50 juice. Wondering if 3.8 is over heating it for my chain vaping style (kinda going nuts to replace the butts)? Anyway, thanks again…glad to hear these can be cleaned. Won’t have new atomizers for a good week. What took it over the edge I think was trying to restrict airflow by covering the holes. I was led to do it because of lousy hits which I now know is related to the dirty atomizer. The pressure in the tank changes. You can use cotton from q-tips on the budget end. I went on ebay for 3mm silica wicks. I twist two 3mm strands together, pop the rode back on, goes away the gurgle. Once the wicks get weak I have to repeat the process. I recently tried to switch to iclear30-huge amount of juice in the mouth, big mess, no solutions. All of vaping has it’s issues. I’m only willing to work on the small ones.